Cool tie dye patterns are simple. Advanced tie dye patterns are fun, but tie dye shirts people love are not complicated. 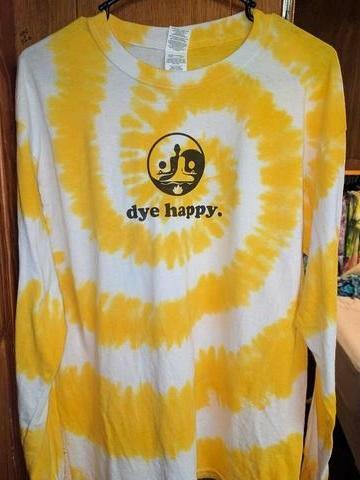 Start with a one color tie dye. Tie dye patterns are how you fold your fabric, how many, how big, and where you apply rubber bands, and how many, how much, and where you apply dye color. Fold your fabric to control where you want dye color to flow. Apply rubber bands to control where you don't want dye color to flow. Apply dye color where you want the dye color flow to start. Learn how to tie dye patterns on your own. Experiment. Mistakes are good. Creasing the folds create Geometric tie dye patterns. Go to Tie Dye Colors for beginners to learn dye colors basics. Understand how colors and dyes work together. White space (no dye) is okay. Lay the fabric flat then pinch, pull, and twist the center of the fabric until all of the fabric is in a twist. Apply dye color to each side of the rubber bands. Lay the fabric flat then pinch and pull where ever you want a sunburst. Lay the fabric flat then pinch and pull the center of the fabric until all the fabric is hanging. Apply rubber bands where ever you want a ring in the bullseye. Lay the fabric flat and fold it back and forth (pleat) until all the the fabric is folded. Lay the fabric flat then start scrunching it toward the center until all the fabric is scrunched. Apply rubber bands around the sides to keep the fabric scrunched together. Apply dye color to the top side of the fabric. Flip it over and repeat. Lay the fabric flat then roll the fabric around any tube, scrunch the fabric toward the middle of the tube. Apply your dye color while rotating the tube.